As we all know vampires are huge in entertainment. You canât go anywhere without seeing handfuls of vampire goodies. But the vampire craze is dying down a bit and it appears that angels just might be replacing them. Last time I checked out the new release section at the book store I saw that over half were vampire books and that all of the others were either werewolf books or angel books. But fear not fang fans, vampires arenât gone yet. 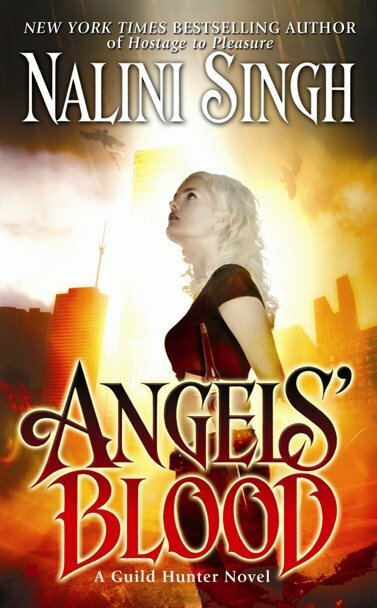 In fact, if you want to mix vampires and angels I have just the book for you, Angelsâ Blood by Nalini Singh. âVampire hunter Elena Deveraux knows she’s the bestâbut she doesn’t know if she’s good enough for this job. Hired by the dangerously beautiful Archangel Raphael, a being so lethal that no mortal wants his attention, only one thing is clearâfailure is not an option…even if the task is impossible. I share a lot of books with you guys and I think out of all of them this book probably has the best reviews from professionals and fans alike. It sounds fantastic, instead of doing just vampires or just angels like most authors, Singh took two popular topics and made one excellent mixture of both. Youâve got angels, vampires, blood, action, lust and more – and all of those things equal pure awesome. Angelsâ Blood is actually part of the Guild Hunter series. The second book in the series, Archangel’s Kiss, was just released February 2, 2010. Find out more at Nalini Singh’s website.